The ICCR Climate Change Workgroup met in mid-June, hosted by the Nathan Cummings Foundation, an ICCR member in NYC, to evaluate the progress over the past year and chart out a path forward for the 2018-19 corporate engagement season. We took time to reflect on the social and faith trends; review the political and economic landscape; and map the growing investor actions on climate. We then evaluated our progress over the past couple years before developing a SWOT analysis, mission and vision. In the afternoon, we discussed the path forward by re-directing the existing programs and discussing some new areas to pursue. Jake Barnett (Morgan Stanley Graystone), together with Mary Beth Gallagher (Tri-State CRI), presented the climate justice perspective by describing the disproportionate adverse impacts climate change has on vulnerable communities. These include decreased agricultural production due to drought resulting in increased migration, disproportionate impacts on women, increased disease burdens due to intensified heat and insect-borne diseases, and displacement from intensified storms due to lack of resilience (e.g. Hurricane Harvey and Maria). In addition, roughly 1.1 billion people lack access to electricity, making the provision of clean, affordable energy essential for communities trying to escape poverty. Unlike secular asset managers, the faith community can elevate climate change from a partisan political discourse to a moral issue that we are all called to address. We need to be bold and exhibit urgency by leveraging partner organizations (Human Rights Watch, Earth Justice, Sierra Club, etc. 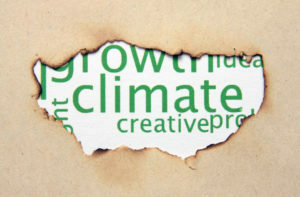 ), and put a human face on the climate change impacts. Aaron Ziulkowski (Walden Asset) provided the political and economic overview noting that, despite growing awareness, global GHG emissions continue to rise, although they have leveled off in OECD (developed) countries. The national commitments made in Paris fall short of the 2 degree scenario and get the world nowhere near the 1.5 degree ambition. Transportation has replaced electricity production as the top emitter in the U.S. due to the displacement of coal by natural gas. Despite the White House announced withdraw from Paris, several states have set targets for GHG reduction, renewable energy and CAFÉ standards (which reduce auto emissions) that exceed federal standards. Japan, the EU, China and India continue to increase CAFÉ standards while Trump’s EPA rolls back U.S. targets. The EPA is being sued for rolling back methane emissions standards in oil & gas production. Economists are confident that economics wins over politics with the cost of unsubsidized wind and solar electrical power now competitive with fossil fuels. We agreed to step up public advocacy and pressure corporations to do the same if the U.S. wants to remain competitive in a low carbon world. Read the rest of the article on Seventh Generation’s website. 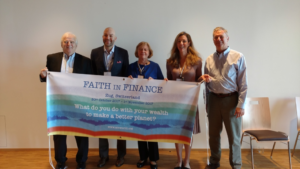 Fr Séamus Finn OMI, chair of the board of the Interfaith Center on Corporate Responsibility, recently addressed the Faith and Finance Conference, hosted at the LaSalle Haus in Zug, Switzerland. In his remarks, Fr Séamus talked briefly about the origins of ICCR more than 45 years ago and the historic legacy that the organization, through its more than 300 faith-based institutional investors, have achieved through a strategy of consistent substantive engagement with publicly traded corporations. This engagement strategy is rooted in the rights and responsibilities that all investors assume when they invest in corporations, informed through the extensive networks that faith traditions have throughout the world and guided by the moral and ethical principles that are grounded in the teachings of their respective traditions. Over the past 45 years, ICCR members and colleagues have been at the forefront of drawing attention to the consequences of many destructive and dangerous products and abusive policies and been successful in recalling corporations to their social purpose, providing avenues for advocacy and redress to victims, and awakening the conscience of other shareholders. The conference in Zug was a unique opportunity to share this story with representatives of many faith institutions and organizations from diverse traditions around the world and to discuss avenues for increased strategic collaboration. 1) Do not invest in companies, products or services that counter to Catholic moral teaching. 2) Exercise responsible active ownership of shares that the USCCB has in the portfolio through a process of engagement with the directors and managers of these institutions. 3) Proactively investing in funds and projects that are designed to promote the common good and sustainable development that in some cases offer a lower rate of return. The good news is that much has been achieved in the first of these categories, also known as negative screens, when excluding investments in specific companies and or industries. Now the work of applying these same screens across all assets classes in a portfolio needs to be accelerated. Secondly, little has been done to take up the work of active engagement and this responsibility for active advocacy and dialogue is more important now than ever given the growing influence of corporations and large investment funds on nearly every aspect of life. Some catholic religious orders and institutions have done the bulk of this work through organizations like the Interfaith Center on Corporate Responsibility, www.iccr.org. Fr. Séamus Finn OMI, Chief of Faith Consistent Investment, OIP Investment Trust & Chair, Interfaith Center on Corporate Responsibility recently spoke on Faith based Investing in Sustainability at an event hosted at the International Finance Corporation.